Chronic diseases account for a substantial proportion of deaths in the South-East Asia Region, ranging from 34% in Timor-Leste to 79% in Maldives. Fuelled by the epidemiological shift towards noncommunicable diseases, the burden of chronic conditions is steadily increasing. Care structures for chronic diseases in most of these countries focus only on certain conditions and are often oriented towards episodic illnesses. An opportunity exists for holistic, country-driven applications of the World Health Organization Innovative Care for Chronic Conditions framework to improve quality of care for chronic conditions in the region. Chronic diseases include not only non-communicable diseases, mental disorders and physical impairments but also encompass several communicable diseases such as human immunodeficiency virus (HIV) infection. These conditions account for more than half of the global disease burden and are now considered to be growing epidemics. Chronic diseases are among "the most prevalent, costly, and preventable of all health problems"  worldwide. These progressive diseases require lifestyle changes and long-term health-care management. The needs of patients with chronic diseases are, therefore, complex and multidimensional. The South-East Asia (SEA) Region of the World Health Organization (WHO), which comprises Bangladesh, Bhutan, Democratic People's Republic of Korea, India, Indonesia, Maldives, Myanmar, Nepal, Sri Lanka, Thailand and Timor-Leste, is home to more than 26.13% of the world's population and about two-fifths of the world's poor. 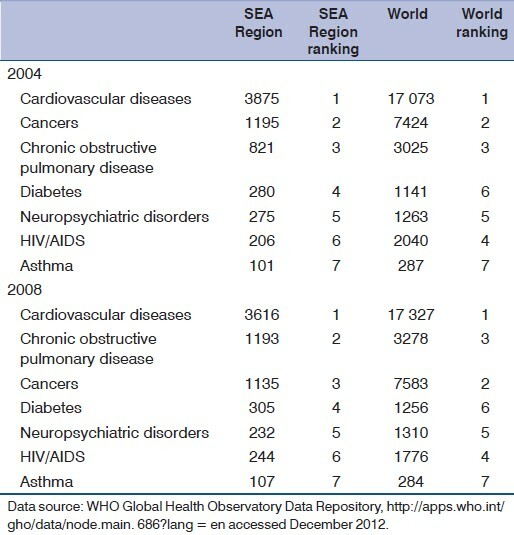 Chronic diseases account for a substantial proportion of deaths in the Region ranging from 34% in Timor-Leste to 79% in Maldives, among which the three top-ranked conditions are cardiovascular diseases, cancers and chronic obstructive pulmonary disease [Table 1] and [Figure 1]. This shift in burden of disease from the traditional foci of infectious diseases and maternal and child health issues to the complexity of chronic conditions poses significant challenges to the mostly vulnerable and resource-constrained health systems of the region's countries. Moreover, chronic illnesses are expected to become more prevalent owing to the rapidly ageing populations of the region, leading to rise in demand for care. These challenges raise important questions about the adequacy and quality of care for people with chronic diseases. Most countries of the SEA Region have introduced structures, institutions and efforts, tailored to their local care structures, to address selected chronic conditions. In their pioneering chronic disease management systems, Thailand and Myanmar have established long-term care for HIV patients that is integrated within public health-care facilities and linked to communities. WHO Package of Essential Non-communicable diseases pilot projects have been rolled out in Sri Lanka and Bhutan to integrate management of chronic diseases such as diabetes and hypertension into primary health care. Nevertheless, care structures for chronic diseases in most of these countries target only certain selected conditions and are often oriented towards episodic care. Most countries do not have a formal structured and integrated chronic disease management model; existing disease management is largely sporadic and unorganized, whether in public, private or philanthropic settings. It is imperative that innovative health-care delivery systems be configured to ensure the availability of adequate, high-quality care for patients with chronic diseases. The Institute of Medicine of the United States of America reported that chronic care has been inadequate because of the increased demand for care (increased prevalence) together with the inability of the system to meet those demands (poorly organized delivery system). The challenge of provision of quality care for chronic diseases is daunting and the traditional care structures and practices are inadequate to address the need. Health systems and organizations are therefore using a broad range of innovative approaches to restructure their care. The Chronic Care Model, most notably, has received widespread credibility and has been found effective in many health-care environments. ,,,,,, The model adopted by Singapore  purports to be contextualized to the general Asian setting with emphases on primary care and self care. The Innovative Care for Chronic Conditions (ICCC) framework  developed by WHO is an expanded version of Chronic Care Model and provides a comprehensive and flexible approach to management of chronic diseases in resource-constrained settings, particularly in low- and middle-income countries. 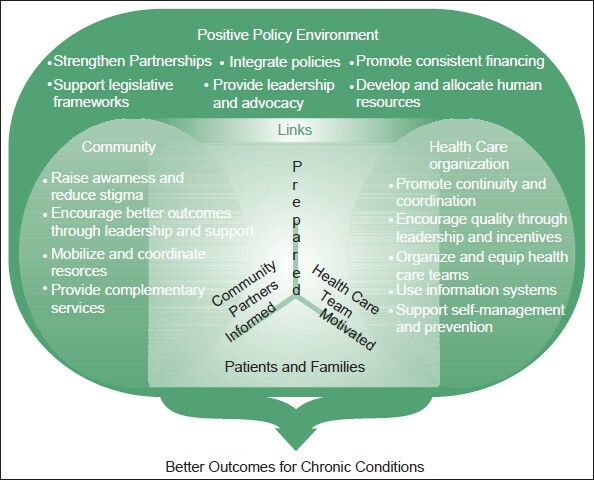 The ICCC framework recommends a system based on three primary components: (i) the micro level, which comprises patients and their families; (ii) the meso level of health-care organizations and communities; and (iii) the macro level of the policy environment [Figure 2]. The ICCC micro level represents partnerships between patients and families and the health-care teams. Patients and their families need to become active care participants through personal responsibilities, knowledge about the management of their conditions and implementation skills. Health-care personnel must support and promote their efforts. The best outcomes are generated when both partners are prepared, informed and motivated to manage chronic conditions. A high standard of quality chronic illness care is ensured by productive interactions between health-care teams and patients. For the SEA Region, this approach highlights the need to review clinical practice with an emphasis on communication, patient tracking, information management and counselling skills; the need for health workers to have capacity in these areas is underscored. The framework also calls for the design of appropriate incentives and support systems to prepare, inform and motivate health-care organizations (in both public and private sectors) and patients (and their families). At the meso level, the need to strengthen health-care organizations and their links to the community is emphasized. Health-care organizations, by creating an environment that values health workers' skills, personnel mix, information systems and patient support systems could improve outcomes for chronic health conditions. Continuity of care, co-ordination among providers and promotion of quality care of chronic illness are other approaches that need strengthening. Care delivery structures across the countries in the SEA Region need to be remodelled, highlighting the need for health-worker expertise, promotion of scientific evidence, standardisation of care processes, integrated and shareable clinical record systems and health promotion. The broader community plays a vital role by supporting organized health care in the management of chronic conditions. Since patients with chronic conditions spend most of their time outside health facilities, an informed and prepared community can help fill critical gaps in services. When organized health care is complemented by community services, outcomes of chronic care have the potential for significant improvement. Community support activities - such as reducing stigmatization, building awareness and resource generation - are critical components of comprehensive care. There is already a strong community presence in health-care delivery in most countries of the region. The tremendous potential of such community resources may be further exploited and institutionalized to accrue additional benefits. Ministries of health and other health-care leaders must continue to provide the leadership, incentives and resources necessary to make improvements in chronic care. The present disease-based approach does not provide a favourable environment for managing the full spectrum of chronic diseases; a generic model that facilitates a holistic environment for chronic care is needed. Since financial resources in most of the region's countries is limited, the existing preponderance of financing vertical care structures would need to be replaced by generalized funding for overall organization of an integrated care structure. Simply adding capital will not significantly improve the quality of care and outcomes for chronic conditions;  holistic interventions based on country-driven innovative approaches are essential. Chronic diseases have already become a prime concern for health-care systems across the SEA Region and the challenges ahead are significant. Most countries in the region have resource-constrained health systems; care structures for chronic conditions are unstructured and sporadic; and awareness of concepts such as use of a holistic approach is minimal, even among health professionals. These challenges call for a re-emphasis on the components of care of the ICCC framework by integrating as many features as possible or feasible along the lines of partnership at the care level, health-care delivery-system design and favourable policy environment. There needs to be renewed commitment to and in support of chronic care at each these three levels. Countries in the SEA Region already have certain structures and institutions in place to address chronic diseases. Through more innovative application of the ICCC framework, these countries can reap better dividends from limited investments in health while attaining improved quality of care for chronic diseases. 1. World Health Organization. Preventing chronic diseases: a vital investment. Geneva: World Health Organization; 2005. 2. National Public Health Partnership. Preventing Chronic Disease: A Strategic Framework, October 2001. Available from: http://www.nphp.gov.au/publications/strategies/chrondis-bgpaper.pdf [Last accessed on 2012 Sept 17]. 3. 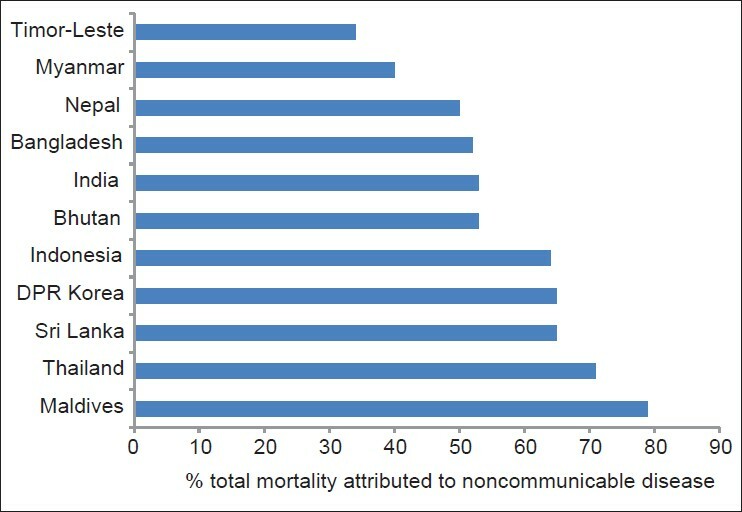 Poudel KC, Fujita M, Green K, Poudel-Tandukar K, Jimba M. Non-communicable diseases in southeast Asia. Lancet 2011;377:2004-5. 4. Narain JP. Integrating services for noncommunicable diseases prevention and control: Use of primary health care approach. Indian J Community Med 2011;36 (Suppl 1):S67-71. 5. Institute of Medicine. Crossing the Quality Chasm: a New Health System for the Twenty-first Century. Washington: National Academy Press; 2001. 6. Wagner EH. Managed care and chronic illness: health services research needs. Health Serv Res 1997;32:702-14. 7. Bodenheimer T, Wagner EH, Grumbach K. Improving primary care for patients with chronic illness. JAMA 2002;288:1775-9. 8. Sperl-Hillen J, O›Connor PJ, Carlson RR, Lawson TB, Halstenson C, Crowson T, et al. Improving diabetes care in a large health care system: an enhanced primary care approach. Jt Comm J Qual Improv 2000;26:615-22. 9. Fulton TR, Penney BC, Taft A. Exploring a chronic care model in a regional healthcare context. Health Manage Forum 2001;14:6-24. 10. Chin MH, Cook S, Drum ML, Jin L, Guillen M, Humikowski CA, et al. Midwest cluster health disparities collaborative. Improving diabetes care in midwest community health centers with the health disparities collaborative. Diabetes Care 2004;27:2-8. 11. Stroebel RJ, Gloor B, Freytag S, Riegert-Johnson D, Smith SA, Huschka T, et al. Adapting the chronic care model to treat chronic illness at a free medical clinic. J Health Care Poor Underserved 2005;16:286-96. 12. Epping-Jordan JE, Pruitt SD, Bengoa R, Wagner EH. Improving the quality of health care for chronic conditions. Qual Saf Health Care 2004;13:299-305. 13. Cheah J. Chronic disease management: a Singapore perspective. BMJ 2001;323:990-3. 14. World Health Organization. Innovative care for chronic conditions: Building blocks for action. Geneva: World Health Organization; 2002. 15. Wagner EH, Austin BT, Davis C, Hindmarsh M, Schaefer J, Bonomi A. Improving chronic illness care: translating evidence into action. Health Aff (Millwood) 2001;20:64-78.